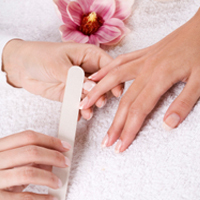 Price: £42.00 Manicure Our regular manicure will give your hands & nails a great treat! We use high quality products to give the highest standard of treatment & finish. Deluxe Pedicure with Paraffin Wax* Having a pedicure can leave your feet looking & feeling wonderful & with the added luxury of the softening & conditioning effect of paraffin wax, even the driest of feet can look presentable. Pedicure* Our regular pedicure will not only shape your toe nails & tidy cuticles but we will remove the rough hard skin that can make your feet feel uncomfortable. With a soothing massage & shiny polish your feet will look & feel fabulous! Manicure with French Polish A French polish will give a natural look to almost any length of nail. The colour combination is endless from subtle & subdued to the bright & bold. Pedicure with French Polish A French polish will give a natural look to almost any length of nail. The colour combination is endless from subtle & subdued to the bright & bold. Shape and Polish for Hands A shape & polish will give your nails a quick pick me up between manicures. Shape and Polish for Toes A shape & polish will give your nails a quick pick me up between pedicures. Lycon Hot Wax Eyebrows Lycon wax allows for quick application, extra strong grip and no skin drag or sticky residue. This wax is a complementary blend of natural aromatherapy ingredients, where the specially chosen conditioning and therapy oils allow for total comfort and satisfaction. Lycon hot wax is especially advised and suitable for intimate areas of the body and face. NEW AB Brows AB Brows combines tinting, threading & waxing for a perfect shape & is finished with the Jane Iredale Bitty Brow Kit... this natural face lift will leave you ready to face the world! Threading An ancient technique that will give a very defined shape to your brows. Excellent for fine-fluffy hairs, as well as normal to strong growth. It uses no chemicals or heat, so is good for sensitive skin. You will never go back to plucking, & it may last longer. Weekend Lashes They give an instant made up look & are great for special occasions when you want to create a full mascara look. Semi Permanent lashes are small clusters of lashes in brown or black & varying lengths. LVL Lashes - Length - Volume - Lift* LVL stands for Length, Volume, and Lift. 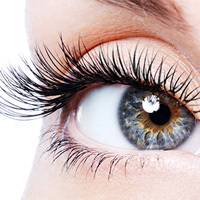 The stunning alternative to eyelash extensions! LVL has been designed to enhance your natural eyelashes creating the illusion of longer, thicker lashes giving you a fabulous wide-awake appeal that is completely natural AND yours. 14ct gold earrings with special smooth backs for comfortable hygienic ear piercing or choose from different styles & sizes from the Inverness range. Cleansing solution included.